I designed this quilt top some time ago in Electric Quilt. I used ideas from Ruth B. McDowell’s book Pattern on Pattern to create the design. In the book, Ms McDowell suggests laying a pattern in different sizes on top of each other to create sub-patterns. I like the repetition of shapes.It looks almost as though the shapes are echoes of each other or maybe like they are ripples on a pond. I also like how the border contains the whole thing. If I were ever to actually make this into a quilt I would probably quilt it with a simple curvy panto. Isn't that a great quilt? It's so much fun to play with the computer designs–if you could only make them all. I don't know that book by Ruth McDowell; it sounds good. Awesome design. I love the other two that inspired it too! They both look like fun! You've got a good eye! I also enjoyed your work on the General Quilt! Wow! you've got talent to be able to take the vision of another quilter and push it further. My goodness Deb – you certainly have an artist's eye. This is a wonderful pattern. Great design! 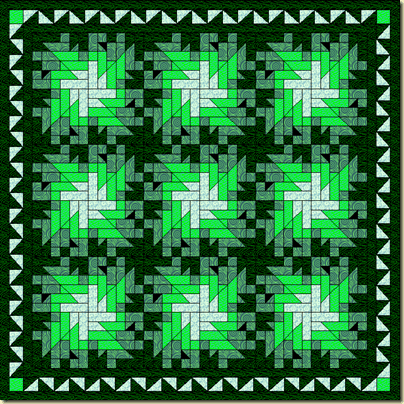 I love doing quilts in EQ but some of them would be a nightmare to actually piece.